This looked very pretty!! highly recommended!!! It matches everything perfectly well! I am so glad I don't have to return it! Inspired by global travel and the bold, colorful motifs adorning fashionable ski chalets, Safavieh translates rustic lodge style into the supremely chic and easy-care Adirondack collection. Crafted of enhanced polypropylene yarns, Adirondack rugs explore stylish over-dye and antiqued looks, making striking fashion statements in any room. This rug is crafted using a power-loomed construction with a polypropylene pile and features main accent color of ivory. This rug is beautiful and looks just like the picture. 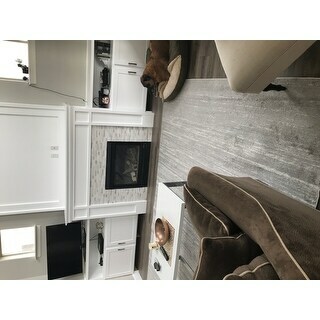 What you need to know is that this rug is a little bit on the thin side especially if it's going on a solid floor (not carpet). I recommend getting a nonslip rug mat to add some cushion and to prevent it from moving. I chose this rug because I have a dog who sheds 24/7, 365 days a year. It's easy to vacuum and stays pretty soft and fluffy. I wanted a soft rug which it is. 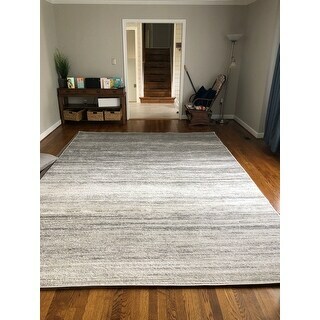 I gave this rug a 4 out of 5 stars because of how thin it is. 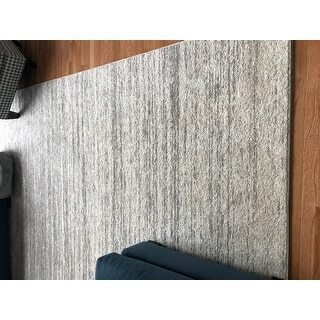 Great rug, true to color, perfect size! More on the light grey side which you can't really see in the photos. The colors go from dark to light and fade throughout. We will be using this in a modern style dining room. It's definitely more of a neutral color that can be used with a more colorful room. We've purchased all of our rugs from this brand and it tends to be great quality with 2 dogs running all over them constantly with toys and bones, etc. Enjoy! I’m very pleased with this rug. The ivory looks white but the silver accents allow the rug to be more forgiving in terms of light debris and stains. It’s not at all plush so my roomba can go from hardwood floor to rug without issues. It’s a great buy for the size and look. I am so happy with this rug! I was leery of ordering a rug online, but this rug really exceeded my expectations. The picture is true to color, it's soft on the feet, and the price was awesome for a 9x12! I love the ombré pattern from white to gray; it's modern without being too busy. Shipping was fast, too. I can't say enough good things about this rug!! I find great value in the price for a rug this size. Though it is thin, it serves its purpose in my living room. The pattern is exactly as pictured, but I feel it is a little darker on the gray portion of the rug. I would recommend to friends. 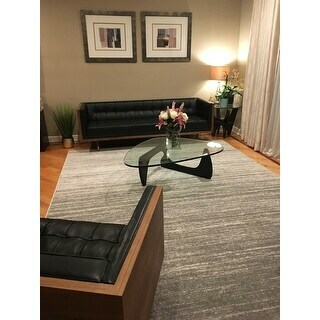 Actually have a friend that ordered the exact rug after seeing mine, but smaller size. 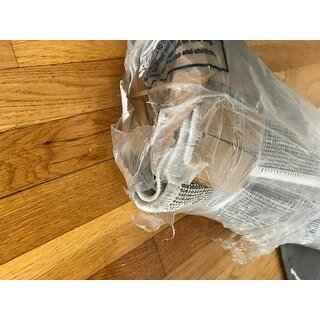 My only complaint is the packaging of the item. Traditionally rugs are rolled and wrapped up during shipping, but this arrived folded up many times. It is harder to get random creases throughout the rug to even out than it is to get a rug to uncurl. 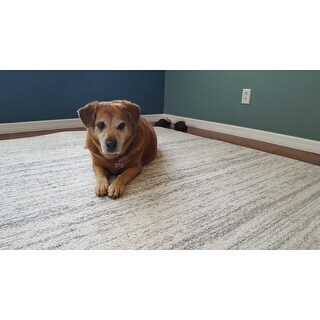 The rug is very soft and thin / low pile. Lovely colors, bright white/ ivory with soft/muted grey. Feels very contemporary in style. Easy to vacuum. Exactly as described. Fast delivery. Love this rug! Be aware that it is a little darker than pictured and has an ombre effect. 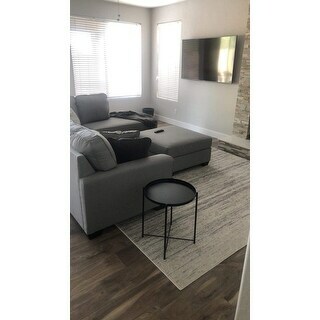 We have the darker gray portion of the rug where towards the higher traffic section of the living room and the lighter/ivory section of the rug towards the lower traffic area. 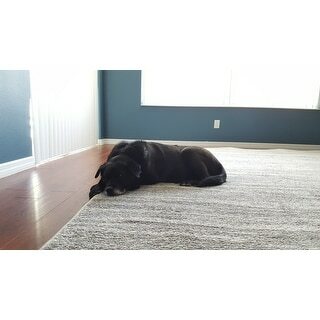 We purchased a rug pad, Mohawk Ultra Premium Rug Pad for All Floors (we have hardwood floors in our living room) and it definitely made the rug feel extra plush. Would highly recommend this rug. 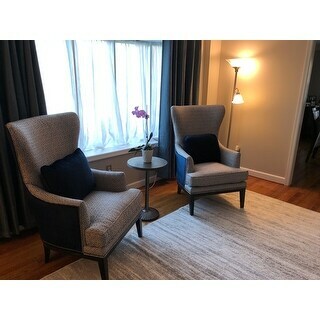 Very nice rug, pleased with color and weave. It's large and fairly good looking. Can be cleaned easily but lacks the weight needed to easily lay flat. Good purchase fir the price. Rug delivered on time and looked great. Smell was mild but tolerable. The problem was when you touched it there was a film or grease left on you. This also got on our clothes and socks. Just a weird greasy film all over the rug. Would recommend this rug. Just bought another one in a 8x10 for my office. Love love this rug! It’s a great neutral base for any room! So glad we went with this option for our living room! Now I need to shop for the family room! Good quality. Couldnt decide on a solid color or a pattern, ombre effect is a good compromise. A little bit more faded than I expected but the material feels great, nice color. 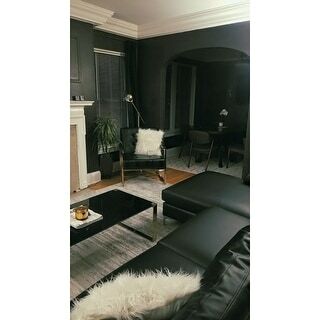 Can’t wait for my new couch to get here so I can see the whole look! The rug fit perfectly with my decor but it’s thin. 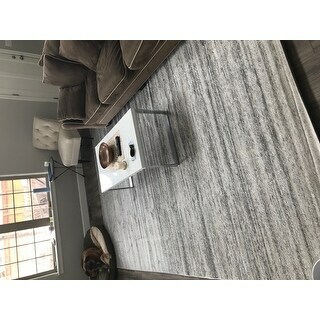 I wanted a white and gray rug to brighten up my living room and this rug was perfect. I plan on buying a rug pad to put underneath for some cushion. 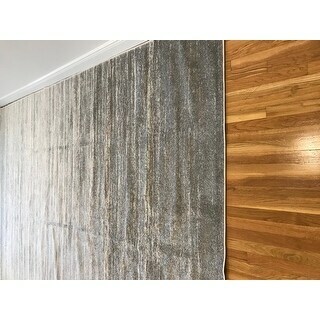 I used this in bedroom and it looks great. I absolutely love this rug. It came quickly and looks great in our livingroom. This rug is GORGEOUS!!!! (These pics taken while still in the middle of redecorating/updating our house.. will have a new couch/tv etc) I highly recommend! 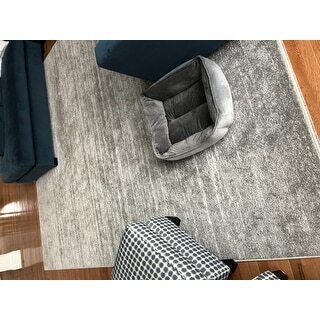 Gorgeous rug that is holding up nicely with 2 dogs! "Is this rug soft to touch? Grand baby will be playing on it. :) I plan on using a rug pad to provide cushioning. Thanks!" "Does the gradation of color become more gray/dark towards one side or is it even throughout? Some of the pictures make it seem less symmetric. Thanks!" Yes, it is an ombre look. Not a straight color look throughout. You probably would not notice it though as it is gradual and some of it might be under furniture. We do love it! This rug should exhibit minimal to no shedding.
" 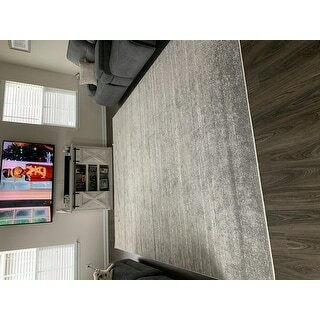 Can I get this rug in a 5 x 7 or a 5 x 8 ..or something similar in size I love the rug I just need it smaller"
Yes it comes in different sizes but beware it doesn't look like the picture. One side is way darker than the other and I don't like that! "Is the 9ft x 12 ft measurement exact or a round figure?" "I like this rug a lot, but I've read in several reviews about something sticky "a slight tacky film of some sort" on their socks after walking on it. Do you have any information on this? I'd hate to pay for shipping going back if it has that problem. Thanks." I didn't have any issue with this at all. We don't have any issue with this either! "Is there a lot of silver? I'm looking for more of an ivory rug and I don't want any surprises"
It is more silver than ivory.